Two studies, one by “The online Journalism Review” and the other by “Pew Research” investigate how users interact with news online. We want to investigate how these findings make the case for news curation, and how news curators can benefit from these findings. It is apparent from this research that most people do not follow news religiously. This fact fact implies that when users receive news, they tend to form opinions that are influenced by the narrative and not the context. Therefore, curated news pages that let people discover different points of view, and investigate the news in context offer a excellent opportunity to elevate the conversation. In other words, a curated news page lets users check in at their leisure and catch up with events in context. Where news sites need to constantly update users with the latest news, news curation sites will be able to provide context and inform users by organizing and maintaining news from multiple sites in one place. The next study sheds light on user habits and the best format for serving up curated pages. This study gets into users interaction with news pages by using eye track video to monitor the participant’s attention by frequency and duration. 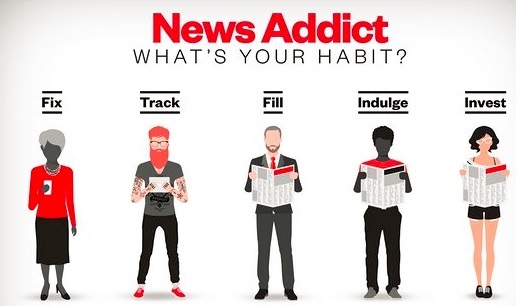 Considering the fact most people do not follow news religiously and when they do they mostly look at headlines and summaries suggests that news curation sites should optimize presentation and navigation of headlines in context to provide value! Most topic curation products let the curators editorialize (change and modify) article headlines and summaries. Curators will differentiate their art by the way they manage and maintain their curated articles through headlines, summaries and tags. Following are three examples of curated content on the KBucket platform. KBucket’s vision and mission is to provide curation tools empowering authors to organize and manage hundreds of links on one page. Based on these two studies you be the judge as to the effectiveness of these curated pages. You can register and post your curated research on the KBucket.com platform for free. Get wither Kurator, for Chrome, or KBrowser for Firefox to get started.